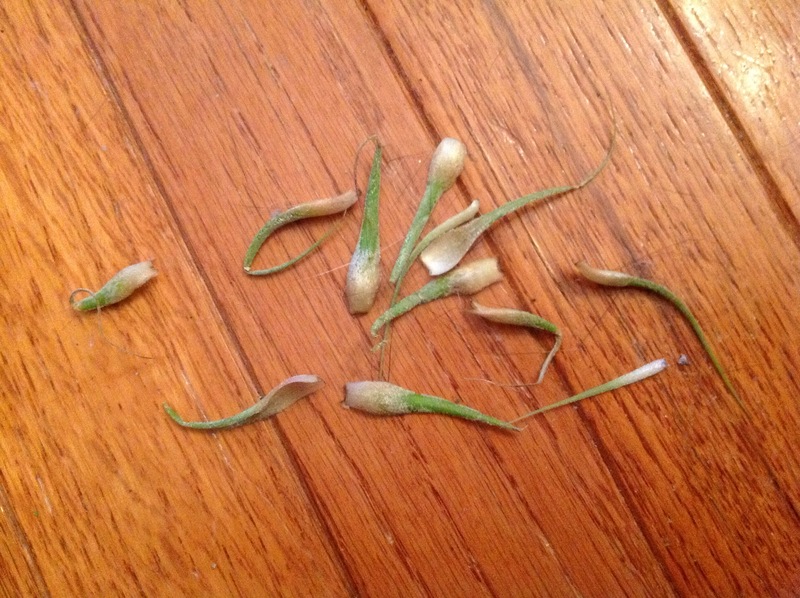 When I got up this morning, this was what was left of one of my air plants. On the bright side, this one is blooming. 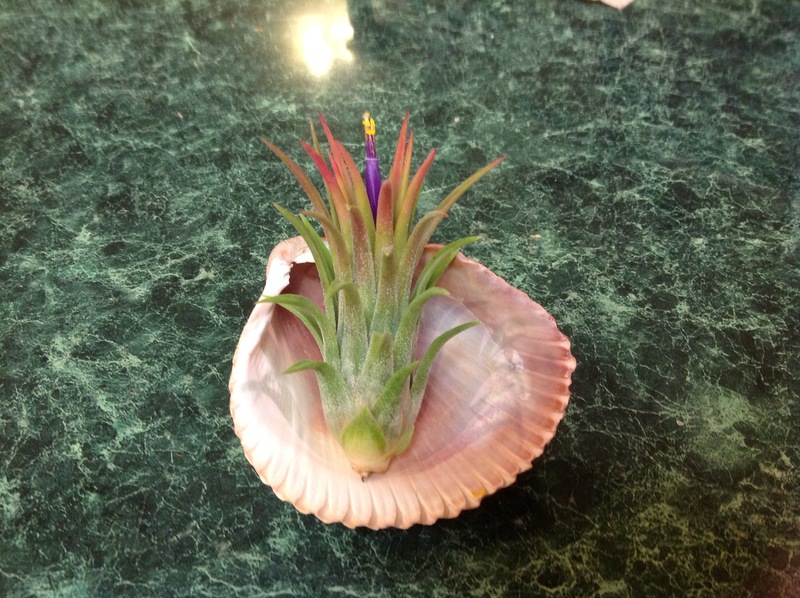 I’ve never seen an air plant bloom! Oh…those naughty kitties! Looks like something my cat would do…and you can’t STAY mad at them for more than a minute. Air plants bloom once, then produce “pups” and the mother plant eventually dies. They can produce several pups so you can end up with dozens of plants eventually. They are evil cat ninjas prowling around in the night when people are asleep and unaware of their nightly ambushes! LOL! Poor little plant! Ninja cats! On a mission of chaos! What havoc the kitty doth wrought when its mistress is fast asleep! I found parakeet feathers outside my back door this morning. (Mr. Tabby isn’t out at night, so it must have happened yesterday afternnon.) We don’t own a parakeet. I wonder if one of the neighbors does (did) or if it was an escapee from a pet store. Sorry, Tweety! I’ve never seen a blooming air plant. That’s cool! Well, this morning I got up and now I have only two air plants left. One of the intact ones was in the floor, but the cats hadn’t had a chance to destroy it yet. That was the blooming one (sans bloom). The other one not destroyed is the tiny one called “peanut”. You should see my floor. It’s COVERED in pieces of air plants. Oh those capricious cats! And when you interrogate them they all act innocent. I know better, I’m onto your furry little ways. I’m still really digging those air plants. Well, there’s only two left to dig as of this morning. I guess if I get any more plants, I’ll have to put them in hanging globes like many people do. Poor plant. 😦 Evil kitties indeed. Kids are a lot like kids, aren’t they? I think the next time I get air plants, I might leave them here at the office. LOL. There’s only one plant left (the blooming one), so I spent all that money on them for nothing. I’m having to find ways to keep them out of reach. The trouble is, there aren’t too many places out of reach of cats.